​The Oculus TI series, offers dual Visible & Thermal imagers and is the perfect solution for short to mid-range night & day surveillance applications. Oculus offers SD, HDIP or HD-SDI video outputs along with various fixed FOV thermal options. The Oculus provides the best performance available within a rugged pan and tilt casing of this size. The Oculus TI range employs DRS’ proven un-cooled high resolution 640 x 480 (DB) or 320 x 240 (DA), 17μm VOx thermal imaging technologies to provide man detection up to 2.1 kilometres. The DRS thermal uses ICE to enhance contrast and features continuous digital zoom. All models offer simultaneous video verification provided by a 40x zoom module or 30x HD zoom module. As with all Oculus units, everything is fully housed within a hard anodised aluminium casing, fully rated to IP67 and ready to handle the harshest environments. The toughened, optically flat glass provides clear images, even at the highest zoom levels and can be kept clean at all times by the compact wiper unit. 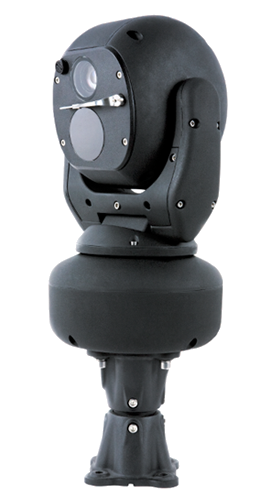 Optical encoders for both the pan and tilt axis provide highly accurate positioning and repeatability, allied with self-correction systems that will counteract any external interference with the moving head. The Oculus TI range can be mounted upright or inverted and the yoke can be offset to eliminate blindspots through a full 360 degrees of rotation. Mounting accessories are available to suit standard mounting platforms, including 4” PCD. DRS’ proven thermal imaging technologies integrate with Silent Sentinel’s Harmonic Drive and optical devices. High performance and reliability in any environment.